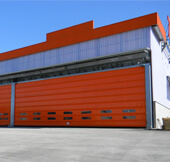 External Applications High Speed Doors - lightning quick and safe. 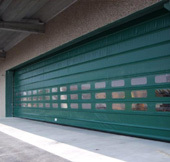 Our External Applications High Speed Doors are reliable and cost effective. *Spam check, what is 2+4? Our most versatile door that offers 240v inverter driven high speed operation combined with self-repairing, soft edge technology to ensure continuous uninterrupted use in even the most arduous of applications. Reliability and simplistic design is the key to this doors success. The ballasted bottom safety edge, specially designed guides with compression spring and a unique zip arrangement provides the stability for the product to reliably perform over many years protecting your premises from air loss, vermin ingress, security, staff comfort etc. The larger version of the same model that offers 415v inverter driven high speed operation to cater for the increase in size capability the model 7000L also uses the self-repairing, soft edge technology to ensure operation in openings up to 8000mm x 8000mm. As standard available in sizes up to 8000mm wide x 8000mm high but large sizes available on request. The cost effective solution for large openings where a simple, strong screen is required to protect your product and employees from the elements. This product uses a heavy duty 3 phase motor to drive the barrel and belts that pull up the wind bars integrated into the curtain which are all housed within the strong galvanised steel frame. 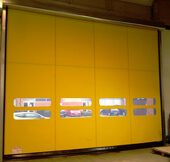 Reliability and simplistic design is again the key to this doors success. The tubular steel wind bars ensure this door can cope with very exposed locations and work in wind speed of up to 140km/h. Operating with full safety devices such as bottom safety edge, integral photocells this door is ideal for any exposed application. The door with the largest size capability, the Model 9000 is suitable for operating in wind speeds of 160km/h in sizes up to 50m wide x 25m high. The twin skinned curtain covers the fabricated wind brace arrangement which is suspended from the heavy duty lintel section by a series of straps. When opening, each wind brace is picked up by the straps and stacked at the top. Max 50000mm wide x 25000mm high. Security with high speed can be achieved through one of three methods all of which are available from Enerco. Firstly we can install a high speed fabric door behind virtually any door. Secondly you have the 5000 Combi door which in essence is an insulated roller shutter and Delta Speed 7000M combined into one column and heading assembly. 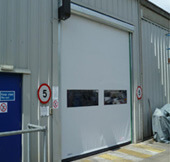 This unique package minimises costs for the supporting frame work and works on the basis of using the security element of the door to secure the premises and the high speed door to work tirelessly during opening hours saving vital energy costs. 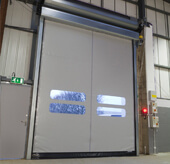 The third and final option is to use either our Delta Secure 1000 or Dynamic Spiroll door which are single insulated high speed doors working which provide the speed for opening and closing whilst providing security when the premises are closed. Call Enerco today on 0800 316 6131 to discuss your industrial door and loading bay requirements and to receive a competitive no-obligation quotation. Enerco Ltd. Unit 2A Wakes End Farm Estate, Eversholt, Milton Keynes, MK17 9FB.